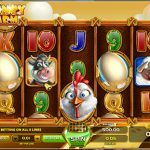 Go to the countryside and watch your money grow in the Money Farm with exciting and rewarding bonuses from friendly farmyard animals. Money does not grow on trees, but it does grow down at the Money Farm . 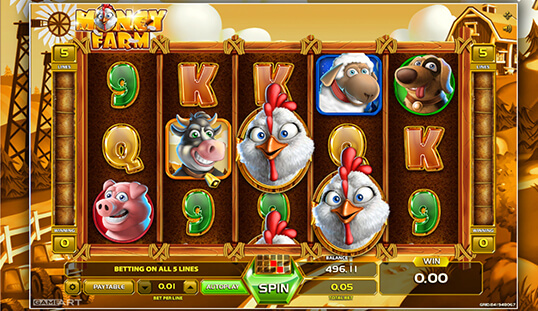 Money Farm slot is one of the offerings from GameART. As a farmer, your goal is to get the winning combinations for you to win the prize. 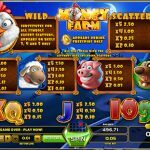 With symbols of farmyard animals and the standard card symbols for the usual slot games, this is a traditional slot game that delivers what it promises. No one can say that GameART skipped on the graphics and the sounds. 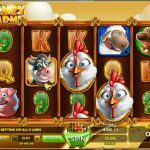 Money Farm slot looks great, if a bit cartoonish. The game has the reels in yellow gold, while the symbols are clear on the reels. The background looks appropriate for the theme and the music and sounds are just right. 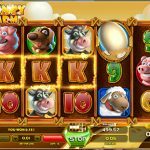 Money Farm slot feels very much like a traditional slot game. It has five reels and a limited amount of pay lines, unlike the newer types of slot games. It actually has just five. This does lower the chances for a win, but the pay table is generous. In addition, there is the wild hen symbol added to the game so that it can increase your chances of winning. There are several fun bonus features for those who play Money Farm. First, there is the gamble feature. Every time a player wins, they can double it by clicking the gamble button. Players then are given the chance to guess what color a card from deck of playing cards will be, either red or black. If they guess right, they win. 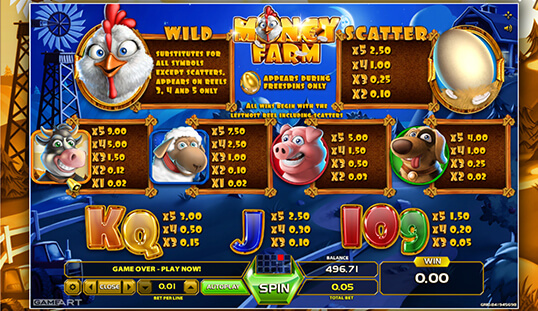 Second, when a wild is part of the winning combination, players immediately get five free spins. 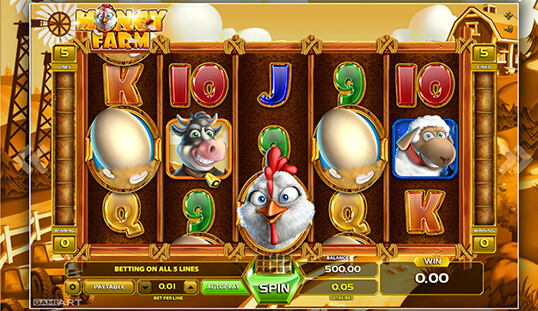 This stacks up and you can keep on getting free spins as long as the hen symbol shows up. Finally, the egg scatter symbol will reward you immediately if two or more of them show up in the winning combination. 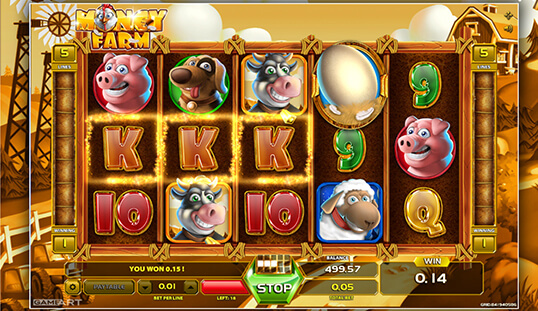 Money Farm slot game is a neat little game that has a lot to offer. With nice graphics and traditional gameplay, people will keep coming back for more. With the partnership of Softswiss and GameART, people can enjoy this slot game in several casinos like BitStarz, BitCasino.io, and mBit Casino.